Around 2009, my attention was captured by the theory that CBT, or Cognitive Behavioral Therapy, was effective in controlling behavior due to IBS. Since my anxieties had been mounting steadily over the years, and IBS was (and is) ruling my life, I thought I’d give it a go. After all, what’s the harm in a non-invasive theory that might even help me cope? The Dr. I chose (for proximity and willingness to specifically target IBS) was OK, I guess. But either she or the entire therapy itself just did not reach me. Whenever she would ask me ” what’s the worst that could happen in such and such a situation?”, I would absolutely think of some terrifying and embarrassing answers. She would dismiss what I said and try to minimize the effect of these situations. While I appreciated the thought process behind what she was presenting, I couldn’t be convinced. After all, I have lived these episodes, and I know how painfully and relentlessly horrible symptoms appear, sometimes with no warning at all. I also couldn’t wrap my brain around all the charts I had to fill out. The questions and answers many times didn’t seem to apply to what I was experiencing in my life. The book, Controlling IBS by Dr. Jeffrey Lackner, was our bible, and this is what she based the therapy on. I proved a most resistant patient. Perhaps a different Dr. might have presented it in a more personalized and palatable form to me – I really don’t know. When I told the therapist I was going to quit after 8 sessions, she said “Well, OK, if you don’t want to put in the work that’s required of you.” I didn’t care for that either, as I would have done anything to get relief. I felt I was getting nowhere with the whole thing…just getting more and more aggravated and frustrated. 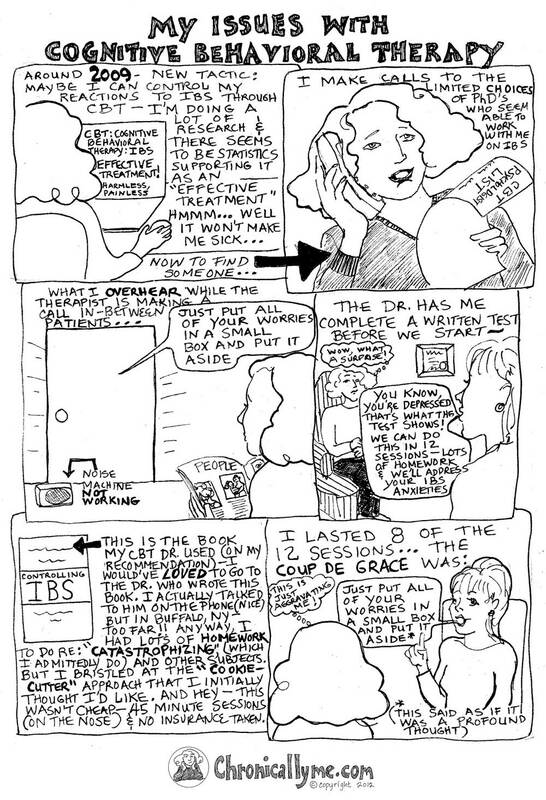 This entry was posted in IBS and tagged alternative IBS therapy, catastrophizing, CBT, cognitive behavioral therapy, controlling IBS, frustrated, frustration, IBS treatment, PhD, psychologist, search for cure, therapist, therapy by Administrator. Bookmark the permalink. Awesome, that reminds me of a doctor I went to some time ago! She told me she was impressed because I stated that I could bear with an IBS crisis up to 7, (on the 1-10 pain scale) before fainting and apparently most people just pray for death around four – or so she said. I lasted about 3 or 4 sessions then told her it wasn’t going to work out. At least that one had the decency to let me go without any nasty comment! Your website is great! I’m not even as old as your IBS, but I’ve been sick for about 7 years. I can manage it on a daily basis most of the time, and knowing there’s no cure makes me less anxious of finding one. Now I just seek ways to make it a bit less painful. So thank you for your comics, because we need to laugh about IBS, it’s not going to snap back at us, there’s nothing to be afraid of! Julie, thanks for your comment on CBT. At least you stopped before you spent as much money as I did! You are right about trying to laugh at our situation…whenever when we can, that is. Actually I went to the doctor who wrote the book and found him condescending abd judgemental.. Thank you for your comment about CBT. Maybe the impression this Dr. had of himself was over-inflated by virtue of writing this book. That’s a big disappointment, as I’m guessing you thought he would be a help. I keep reading about how CBT has been shown to be so effective, but my experience was not good either.